If you use both MS Outlook and Google Docs and would like to work on both in a single environment then you can do so by using Harmon.ie Add-On for Microsoft Outlook. 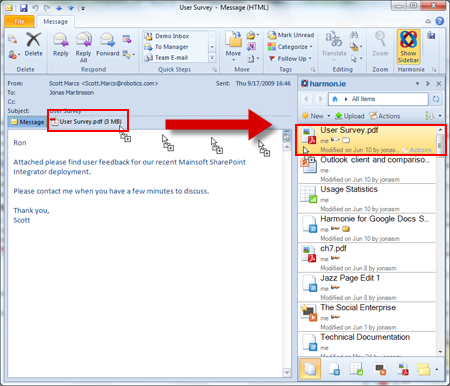 Upon installation, Harmon.ie will add a sidebar to Microsoft Outlook which eliminates the need to use e-mail attachments. It transforms your Outlook into a collaboration console, with full-featured access to your Google documents. From the here you can find, share, and work on Google documents directly from your Outlook. To start using Harmon.ie, you have to login to your Google Account (or register a new one). The sidebar will automatically show all your Google Documents. This free Add-On is compatible with MS Outlook 2007 and 2010.